On Portland » Ecomotion's Fire Sale – Would You Buy an Electric Car for $1210? Home > Green Living	> Ecomotion's Fire Sale – Would You Buy an Electric Car for $1210? Ecomotion's Fire Sale – Would You Buy an Electric Car for $1210? I’ve always fancied the idea of owning an electric car. The idea of not ever having to fuel up at a gas station has always appealed to me. So when I saw that Ecomotion on NE Sandy Blvd. was running a going out of business fire sale I just HAD to check it out. 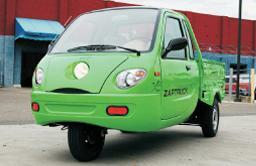 Ecomotion specializes in cars from Zap motors. They basically carry two cars, the Zap Xebra PK (a ‘pick up’) and the Zap Xebra Sedan. Both of these cars are manufactured in China and are completely electric. As I browsed through their selection of cars, the service director Al Ham set my expectations: “Before you get into this car you need to vastly lower your expectations. If you’re looking for a Toyota, go buy a friggin Toyota. What these are, are Chinese cars made from the cheapest parts they can get away with and the quality level on them so low they vary wildly from car to car.” With those words in my head I gave the first of many Zap cars a spin. The thing I noticed immediately was how much attention I got driving the car. I drove a big loop from the Ecomotion building to the traffic circle at NE 39th and back. Heads turned and people pointed, and at first driving it was a little bit of a thrill. But with each successive car I tried out I realized that they all had the same thing in common – they were all truly cheap crappy cars. The story would have ended there, but the cars are a devil’s bargain. A new 2006 model Zap Xebra PK sells there at $2,999. Almost 10K off its initial list price. You get a $1,500 Oregon energy tax credit and a $290 Federal Tax credit, bringing the cost (before license and fees) to $1209! Less cost than some configurations of a MacBook Pro! As I did the math on this over and over, I decided to give the car another spin. How can you pass up a deal this good? Upon my return Al gave me a ‘you again’ look and told me firmly, “at this price, you’re either going to buy it or not. I don’t get paid enough to actually sell these cars.” After handing me the key of another Zap Xebra PK and the dealer plate I was off. With this second round I tested out four separate Zap cars, and even though I willed myself to try to like the car, I just couldn’t. Each one rattled, shook, and barely stopped. I never was able to get any of the cars past 35 mph and at least half struggled to get upa modest hill. At six feet I had to drive the ‘car’ with two feet as the steering column was so close to the seat I couldn’t move my foot from the gas to the brake. Ultimately I decided that even at the ‘they’re practically giving them away’ price the Zap wasn’t for me. I do hope someday to find a car that doesn’t burn gas, find a better more ecological way of getting around town, unfortunately that reality just isn’t there yet. What a shame these car are so tinny. I guess if your 5'4" and only need a car to get you to the supermarket, the bank and the dry cleaners, it would be workable. So maybe there is a market out there somewhere! The Zap P/U we had on hold in Ecomotion's showroom was one you asked to test drive, and when told it was on hold for another customer you asked the dealership to give you our phone number–so you could call us and ask if we still wanted the vehicle… Interesting etiquette. We didn't test drive our P/U before we bought it; we were sold on the concept and benefits. And we love the vehicle. No pollution, perfect for lower-speed, shorter-distance errands. It isn't a luxury primary vehicle; it's a great practical second vehicle. AND! When we drive it, lots of folks we pass turn and look — and Smile. We feel we're not only doing our part for the environment and U.S. reliance on foreign oil, it seems from the many smiles we generate that we're contributing to the Gross National Happiness as well! Businesses are infamous for giving away things that will have you coming back to them or other companies for REPAIRS… the Yahoo ZAP working group list hundreds of others with problems with these Chinese made vehicles. Best idea they can have… send them back to CHINA.